Ornamental Miticide.... Floramite SC Ornamental Miticide provides outstanding control of a variety of mite pests on ornamentals plants in greenhouse, shadehouse, nursery, field, landscape and interiorscape settings. 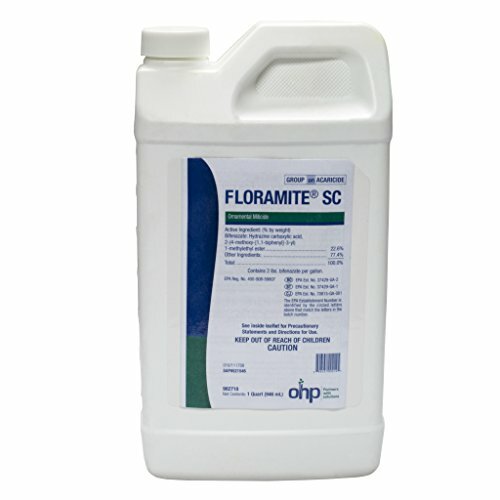 Floramite SC is effective on a variety of mites and all life stages of Tetranychid spider mites. Floramite SC produces quick knockdown through contact activity and long residual control of more than 21 days. Floramite SC is soft on predacious mites and beneficial insects, making it ideal for use in IPM and resistance management programs. Use rate of 4 to 8 ounces per 100 gallons or 1/4 tsp to 1/2 tsp (1.25 mL to 1.50 mL) per gallon. Foliar spray. Mites controlled: Variety of spider mites and all life stages of Tetranychid mites. Labeled for use on: All ornamental plants, including bedding plants, flowering plants, foliage plants, bulb crops, perennials, trees and shrubs. All non-bearing fruit trees and greenhouse tomatoes, varieties greater than 1" in diameter when mature. Quick knockdown with low use rates that controls broad spectrum of mites. If you have any questions about this product by OHP, contact us by completing and submitting the form below. If you are looking for a specif part number, please include it with your message.